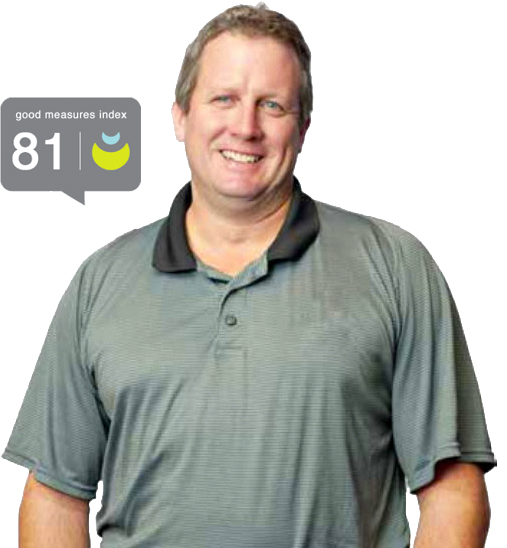 The Good Measures Index (GMI) is a powerful concept that gives you useful feedback regarding how well you are meeting your nutritional needs. Simply stated, the Good Measures Index (GMI) aggregates your nutritional shortfalls and excesses into a single number that ranges from 0 to 100. A high GMI indicates that your recent food consumption has met your near term nutrient needs. A low GMI indicates that your recent food consumption has not adequately met your near term nutrient needs. Having a single number that summarizes how well you are meeting your nutrient needs (weighted for importance, given your medical conditions) is a breakthrough idea that is receiving a strong positive response from a wide spectrum of nutrition professionals. "At my routine visit to my doctor this week, he took me off my blood pressure medication (I had been on it for years), and my cholesterol reading has dropped to 142..."